Interactive GPS art • Grab a pencil! There’s just one route through this giant maze, which begins at Royal Jubilee Hospital (top right) and ends at Craigdarroch Castle, covering five of Victoria’s central neighbourhoods* along the way. 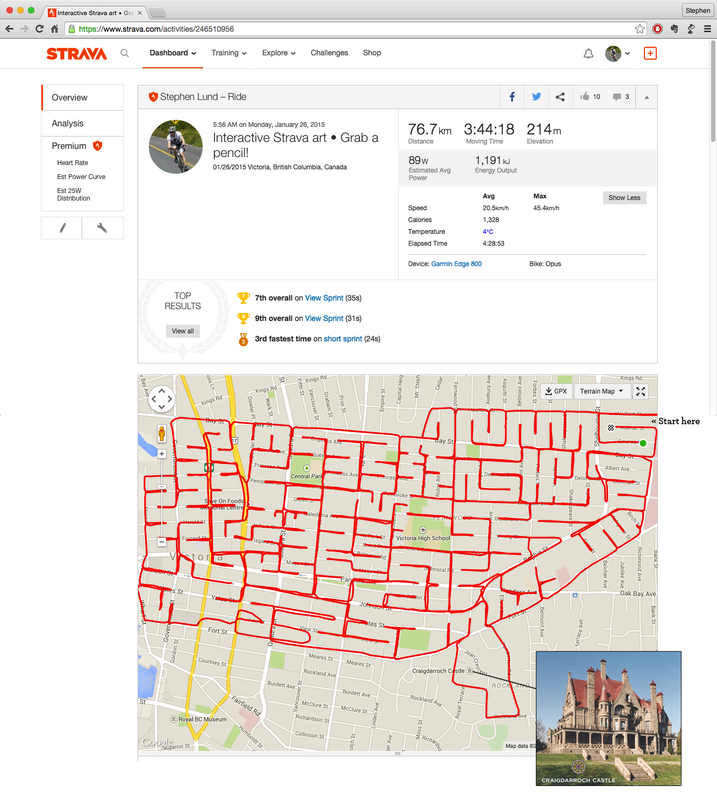 Sketching this work of Strava art was decidedly nerve-racking, as I knew a half-block deviation in the wrong direction could botch the whole thing. It was also decidedly slow-going, as the whole thing is laden with 90º corners, short lines and tight turnarounds. A few things went wrong in the lower left corner – I missed a zig and a zag, and a GPS glitch created some funky loop and whorls – but happily, these didn’t mess up the path through the maze. * The maze covers, in whole or in part, the neighbourhoods of Fernwood, North Park, Rock Bay, Harris Green and Downtown. This entry was posted in gps art and tagged bicycle, bicycling, castle, creativity, cycling, cyclist, games, garmin, gps, gps art, interactive art, maze, strava, strava art, victoria bc. Bookmark the permalink.